Oxford United midfielder Callum O'Dowda says they will use their Wembley defeat in the Johnstone's Paint Trophy Final as a spur to help them seal promotion. 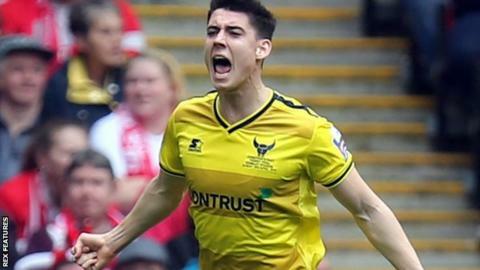 The U's lost 3-2 to League One side Barnsley on Sunday after O'Dowda, 20, had headed them into a first-half lead. Oxford now shift their focus to securing automatic promotion from League Two with six games to play. "The main focus is the league," O'Dowda told BBC Radio Oxford. "Getting promoted is what we want to do." Oxford are second in League Two, two points above fourth-placed Plymouth. and Michael Appleton's side travel to Crawley on Saturday in their next league fixture. "Crawley will be saying that we've just lost at Wembley, so we'll have to get ourselves up for it," O'Dowda said. "But, we're thinking about that game in the changing room and already talking about how we're going to play. "They boys are feeling up for it and I'm ready to play." O'Dowda capped a memorable week with a goal at Wembley just a few days after scoring for Republic of Ireland Under-21s against Slovakia. "That was an unbelievable feeling," he added. "I'm speechless really, it's a big moment in my career and definitely the best goal I've scored so far."